Your commercial space sees a lot of use and even abuse. Customers spill drinks, employees track dirt in on their shoes, and it doesn’t take long for the carpet to become worn and stained. The problem with a dirty carpet is that it reflects poorly on your business. It sends all the wrong messages, and it’s one of those little details that your customers will notice. It’s also an eyesore when the carpeting has stains on it that won’t budge. You may be tempted to call your local contractor and price out new carpet, but that may not be necessary. It’s far more affordable to have the carpets cleaned, and you would be amazed at how many stains professionals can remove that you thought impossible. Instead of spending thousands on new carpet, you can have it restored and brought back to life for a fraction of the price. Reinvest that money in the business instead, and get a few more years out of your existing carpet. When you invest in regular professional cleanings, your carpeting will actually last longer. Dirt becomes trapped in the fibers and starts to wear down the fabric. With our professional cleaning services, that dirt is removed to protect your carpet. Carpets don’t just house dirt and dust. They also become a breeding area for bacteria and even mildew. Any employees with allergy problems will be affected by this. They won’t feel well, call outs will increase and productivity levels will drop. Coming into work and seeing a stained carpet can also harm employee morale, and that will also harm productivity levels. With a clean carpet, you will notice that your employees feel better, and they also feel more appreciated. Productivity levels increase, and that helps boost your profit levels. A clean carpet also creates a positive image with your client base. Whether customers visit your establishment throughout the day or just occasionally, you want them to be greeted by a clean environment. A fresh, clean carpet helps you make a positive first impression and build the right image with your customers. It’s important to trust the professionals if you want to ensure that stains are removed and your carpet looks amazing. 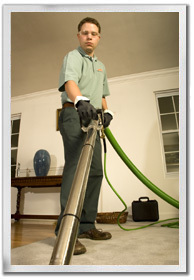 Even if you have an in-house cleaning team, they are busy with the daily cleaning chores. They also may not have the training or supplies necessary to treat stains. Our professional cleaning company will bring in high-powered extraction machines to reach deep into the carpet and pull the stain out, and we also have access to more powerful cleaners. When you have a commercial building to take care of, trust the professionals to keep the carpets clean. You will save money by not replacing the carpet as often, and it will be fresh and clean for your employees and customers. You will preserve your positive customer image, and employee productivity levels will increase. Contact High Quality Carpet today to make an appointment to have your commercial carpets cleaned.